Transfer students, first-generation college students, those on academic probation, and other at-risk groups may benefit from a Personal Librarian Program more than the average freshman. This presentation describes the planning, implementation, and assessment of a boutique program targeting such groups. We discussed group selection, our collaboration with campus units, the involvement of librarians, marketing activities, the challenges we encountered, and the results of our assessment. We shared best practices for establishing such a program, and discussed our concerns regarding its long-term sustainability. Attendees completed an exercise to explore the viability of such a program at their institutions, and to determine which groups to target. 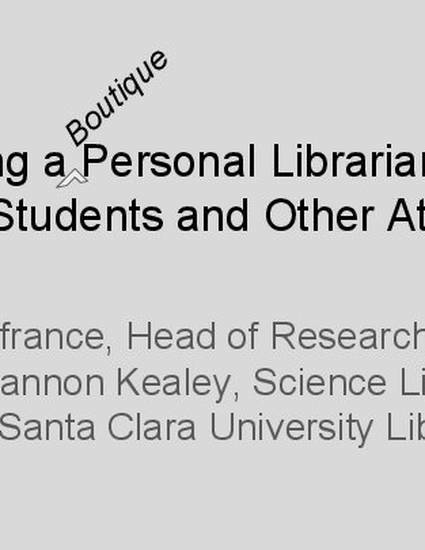 Presented on May 12, 2016 at Personal Librarian and First Year Experience Conference at Kelvin Smith Library, Case Western Reserve University, Cleveland, OH.